Continue making 2012 the year of tastefully taking care of health. Get schooled in more vegetable cookery this February. Also: Makati, I’m coming your way this month with a green juice and smoothie workshop. Watch out! Learn how to make classy appetizers in Much ado about hors d’oeuvres (4th, Sat). Get smokin’ hot and tasty with Barbecue potluck power (8th, Wed). Master 5 sauces, apply them to a million different dishes in Awesome sauces (11th, Sat). 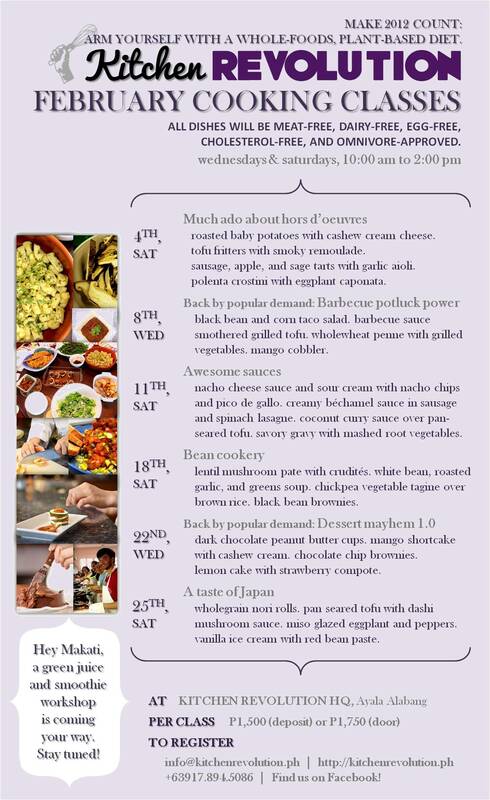 Make beans and legumes a major part of a healthy diet in Bean cookery (18th, Sat). This class is especially good for the bean newbies out there. High in protein, fiber, and minerals, low in fat and cholesterol-free, there’s no excuse to not include them in your whole foods (plant-based) diet. Get rid of the meat, add in the beans, prevent heart disease, diabetes, and obesity easily. More dessert love all around in Dessert mayhem 1.0 (22nd, Wed). Last but not the least, Japan cuisine gets a veg-treatment in A taste of Japan (25th, Sat). By the way, Makati, I’ll be hosting a green juice and smoothie workshop in your neck of the woods in February as well. Watch out!